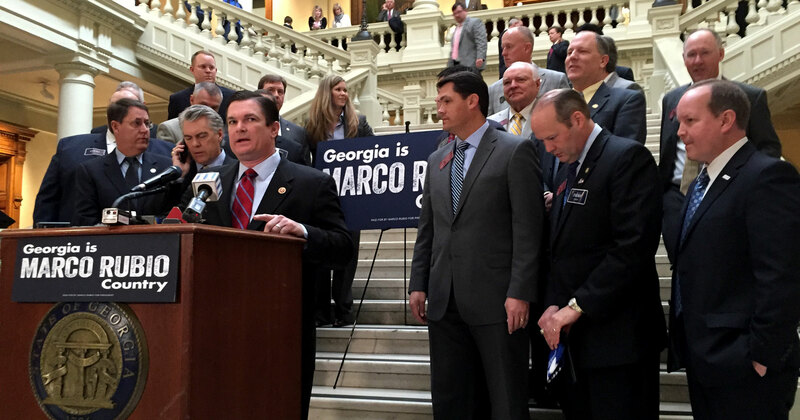 Georgia for Rubio State Chairman Congressman Austin Scott with supporters at a Capitol press conference. As advance voting got underway in Georgia on Monday, the Marco Rubio campaign held a press conference at the state capitol to announce additional members of Rubio’s Georgia leadership team. The most significant addition to the team is 3rd District Congressman Lynn Westmoreland. Other notable additions include State Senators Dean Burke and Tommie Williams, and seven state representatives. According to someone who was not authorized to speak for the campaign, Rubio supporter South Carolina Congressman Trey Gowdy will be in Atlanta on Thursday, February 18th to raise money and campaign for the candidate. Efforts are being made to get Rubio himself to Georgia, but to date, no firm arrangements have been made. In a statement, Congressman Scott acknowledged the additions to the leadership team. The momentum behind Marco’s campaign is undeniable, and we are excited to add an impressive list of Georgia leaders to the team today. Republicans across the country are rallying behind Marco because he has an optimistic vision for our nation and a detailed plan to usher in a New American Century. Georgians will play a very important role in ensuring we nominate the candidate best suited to defeat Hillary Clinton or Bernie Sanders in November, and I look forward to working with this outstanding team to energize voters as we approach the March 1 primary. A lot of politicians in Washington have talked about the harmful impact Obamacare is having on families across the country but few have actually done anything about it. Early on, Marco warned of a taxpayer bailout of the insurance industry, and he succeeded in stopping it, already saving taxpayers $2.5 billion. That’s the kind of leader we need in the White House, someone who can not only identify problems but can implement solutions. I am proud to support Marco Rubio for president and look forward to working hard to build support for his campaign in Georgia. These endorsements are great, but I sure would like to see some type of ground game going on here in Georgia for Rubio. Hopefully they won’t wait until after South Carolina to get things moving here. ABTOC–anybody but Trump or Cruz. The establishment rolls on. What’s Plan B if Rubio craters? Or is that too unlikely to consider? I’m not sure there is a plan B. Whatever happens tomorrow I don’t think that Rubio will fade quick enough for a Bush, Kasich or Christie to take over. That means you would have two or more establishment candidates in the race through Florida and that only helps Cruz and Trump. I think the only way to beat Trump and Cruz is to have only one viable option by Florida. I believe that option is Rubio. While I didn’t listen I saw tweets saying Rush has been touting Rubio over Trump today, and that alone should keep him from cratering. The biggest opportunity for Trump is for the field to slowly consolidate. A Trump-Rubio-Cruz finish should and likely would freeze out the Governors and force much quicker consolidation. I’m not sure any of the Governor’s get very far with a distant 3rd place finish or lower however. Almost all primaries until Florida on March 15 are proportional, so someone like Jeb could skate by getting 3rd place finishes and still only be a few delegates behind until then. Texas is March 1 but it’s proportional so things could still be muddled then. Florida is likely to be make or break for a few candidates. And Illinois is March 15 also- part winner take all part proportional. Repubs should be down to two or maybe three realistic candidates by then. I think Rubio did so bad in the last debate, Bush and Kasich end up ahead of him. I think it will be Trump, Bush, Kasich, Rubio, Cruz, Christie….Also Cruz falls via whimping out agianst Trump in the debate, and the Iowa scandal with Carson. Jeb still has the ability to run for senate in Florida. The primary isn’t until the end of August so he could limp through super Tuesday and then decide to get out. My prediction for tonight is Trump first then Rubio and Kasich are pretty much tied for 2nd and third. Then Cruz fourth with Bush a distant fifth.